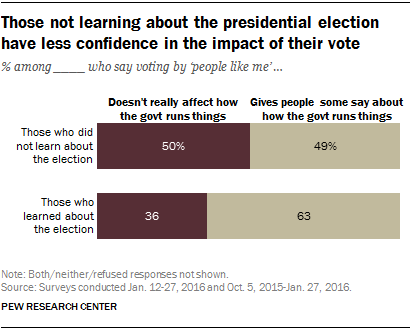 About one-in-ten Americans (9%) did not learn about this year’s presidential election in a given week from any of 11 types of sources asked about in a January Pew Research Center survey. One striking trait of this group is their lack of faith in the impact of voting. Half of this group thinks that their vote doesn’t really affect how the government runs things, notably higher than the 36% of those who learned about the election from at least one type of source. This group shows other signs of being less engaged in government affairs: Only 37% of them follow government and public affairs at least some of the time, compared with 82% of Americans who got news and information about the election. And, while 87% of those who learned about the election follow news in general at least sometimes, this is true of only 55% who did not learn about the election. Additionally, about half (54%) of those who did not learn about the election say that all news media are pretty much the same, compared with a quarter of those who learned about the election. American adults ages 18 to 29 are more likely than any other age group to have not learned about the election. In total, 17% of them did not learn from any type of source, nearly double that of the next highest age group (though the vast majority of younger adults – 83% – did learn about the election). This corresponds to earlier research showing that younger adults tend to be more politically unengaged. Those with more ideologically consistent views are more likely to have learned about the election than those who had ideologically mixed views. Of those with mixed views, 14% didn’t learn about the election from any source, which is higher than those who are more consistently liberal or conservative. Recent research has shown that political engagement is increasingly linked to ideological consistency; it follows that the 9% who did not learn about the election are both less engaged in the political process and more likely to have mixed ideological views. Demographically, those who did not get any news or information about the election are more likely to be nonwhite, less educated, women, and of lower income. This is in line with the fact that these groups tend to be less news-oriented in general.